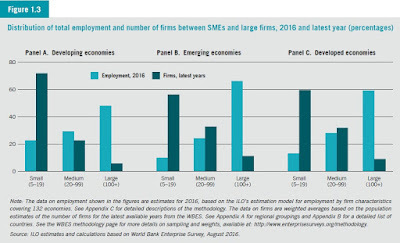 ivate enterprises’ share of employment differs across countries, a strong private sector is the foundation for growth, job creation and poverty reduction. ... While it is true that private sector enterprises are a major source of employment – 87 per cent of total employment, as stated previously – this includes employment generated by informal enterprises, which can be substantial, especially for some developing and emerging economies. According to ILO estimates, about half the world’s workforce is employed in the informal economy, the bulk of which isin the emerging and developing world." health and social services, public administration and defence)." A key insight of the report is that most employment in the formal sector of most countries occurs in large companies. Specifically companies with more than 100 employees make up 10% or less of total firms, but are typically 50-60% of formal sector employment. 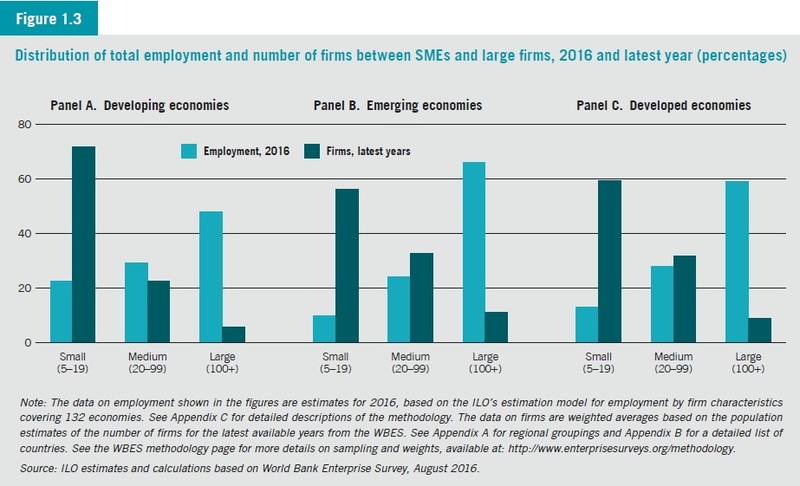 There does seem to be evidence that the share of employment as small and medium enterprises is rising modestly, from about 31% of total formal employment jobs in 2003 to more like 34% at present. In a number of countries, smaller firms may also function as a way for women to enter the (paid) labor force. But in some ways, the line between small, medium, and larger firms can be a little artificial. A friend of mine used to say: "You know what most small companies do? They sell to bigger companies." The point was that large firms make choices about what to do inside their company, and what to hire from outside the company--which in turn affects the opportunities for small and medium enterprises. There are certainly plenty of cases where a large firm drives smaller competitors out of the market, but there are also plenty of cases where a contract from a big firm is what gets a smaller firm off the ground. The policy challenge in many countries across the world is how to encourage the aspects of firms that provide decent employment and goods and services to buyers, while discouraging the anticompetitive or exploitative possibilities of firms. The report refers to the need of firms for "numerical and functional flexibility"-- meaning the ability to adjust quantities of workers, hours worked, worker training, and the production process in response to shifts in market conditions. The hard question here is one that is arising in labor markets all over the world, not just in emerging and developing economies. Extremely flexible jobs are often part-time or short-term or both. In this setting, employers don't worry much about putting time and resources into training workers: after all, those flexible workers might not be there next month or next week. 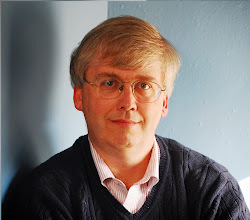 Production processes are designed for interchangeable low-skill or maybe medium-skill workers. As a result, highly flexible job markets can also be markets which don't invest much in improving the skills of workers. As the report notes: "Particularly in the case of women, but also among youth, flexibility can come at the cost of lower wages and limited opportunities for career advancement ..."
Indeed, the ILO report offers evidence that while informal jobs are more common in developing countries, if one focuses on the formal sector, part-time and temporary jobs are more common in developed economies. In addition, the report notes that while share of firms that provide training to full-time formal-sector employees is higher in developed economies, it is still not the most common practice. The ILO report points to some evidence that firms which offer more training to employees also have higher profits, but of course, this correlation doesn't prove that if all firms offered training to employees, they would all have higher profits. Similarly, the report offers evidence that firms which export tend to be more productive and pay higher wages, but again, this correlation doesn't prove that if all firms tried to export, they would all pay higher wages. The underlying challenges here are a difficult ones. In a number of countries around the world, especially in Africa, the Middle East, and south Asia, the working age population is still growing substantially. In these countries, a key social question is how to encourage or facilitate (or at least not to block) the growth of a very large number of private-sector employers. The US economy has also suffered in the last couple of decades from a slowdown in the rate of formation of new firms. An intertwined question is the incentives that a labor market provides for ongoing training and education. If firms do not perceive that a substantial numbers of employees are likely to remain for a period of years, then firms will not perceive it as worthwhile to spend time and energy on training employees. But prospective employees will have a hard time knowing what training would be useful to firms, and perhaps also a hard time raising funds to pay for the training themselves. As I've argued here in the past ("What is a `Good Job?' April 5, 2016), many people would like a job that offers a degree of stability and security, along with building skills so that over time you can assume greater responsibilities and receive higher pay. In our current economic environment, with the high value that it places of flexibility, thinking about the labor market institutions and practices that would help create this kind of decent work is a hard and necessary task.